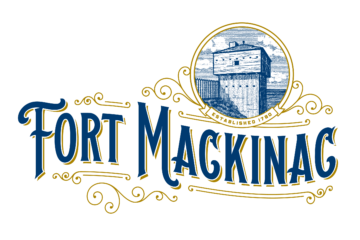 Situated on 150-foot bluffs above the Straits of Mackinac, Fort Mackinac is one of the few surviving American Revolutionary War forts and one of the most complete early forts in the country. In 2015, Fort Mackinac celebrated 235 years standing guard over Mackinac Island. 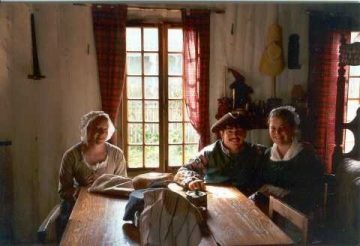 Costumed interpreters greet visitors, portray life in the 1880s, answer questions, pose for pictures, and lead tours throughout the day. Some of the “soldiers” carry original 45-70 Springfield Model 1873, the type used at the fort during the 1880s. Others play music or greet and mingle with the crowds of visitors.  The Mill Creek sawmill was built in 1790 to provide sawn lumber for nearby Mackinac Island. Operation continued through the 1930s. When it stopped production is unknown. 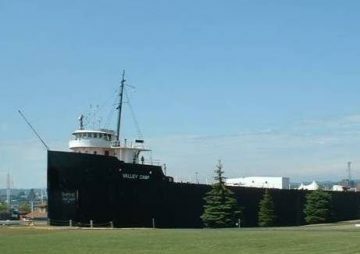 In 1972, the mill was discovered and the site opened in 1984 as a historical state park. Today, visitors can watch the operational reconstructed sawmill and explore the natural history of the site through trails, exhibits and naturalist programs. For the more adventurous, trek though the treetops on the Adventure Tour!  This special, guided nature experience takes visitors over the Forest Canopy Bridge, down the 425-foot Eagle’s Flight Zip Line, and up the five-story Treetop Discovery Climbing Wall. A separate ticket and signed waiver are required. 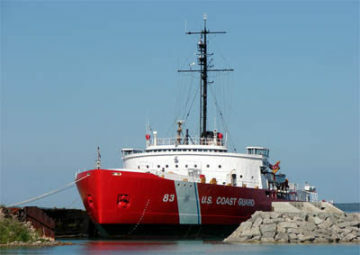 The “Castle of the Straits” has stood guard on the Straits of Mackinac since 1892 joining the fog signal built in 1890, each helping ships navigate through the treacherous waters. Generations of lighthouse keepers lived and worked at this station. 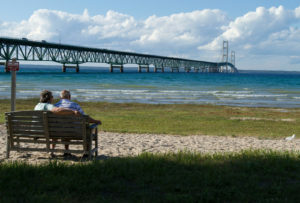 Closed in 1957 after the completion of the Mackinac Bridge, the property has been restored to its 1910 condition. Feel free to wander and get lost in history. 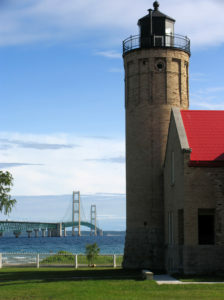 Guided tours to the top of the lighthouse tower are available. The “Tip of the Mitt” area has perhaps some of the richest history in the Midwest. In 1634, French explorer Jean de Nicolet was the first European to see the area, though the Native American presence here goes back far earlier. The area which is today the Straits of Mackinac was particularly important for the Ottawa and Chippewa. The straits area provided ease to transportation and it made sense to set up areas there for trading and commerce. 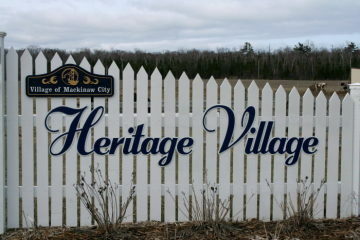 Settlements at present-day Mackinaw City, St. Ignace, Mackinac Island, and Cheboygan all were important to trade long before the arrival of the white man. 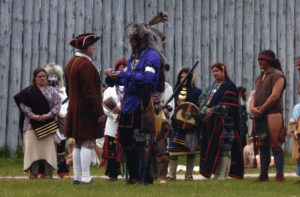 Mackinac Island held special importance for the Native Americans of the area. According to tradition, it was the first piece of land to appear after the great flood. The Great Hare, Michibou, retrieved a grain of sand from beneath the water; he blew on it until it grew, and it became the island we see today. Resembling the shape of a turtle, the island was named Mishi-Mikinaak, meaning “Big Turtle” in Anishinaabe (Ojibwa). It is home to the Great Spirit, Gitche Manitou. Mackinac Island became a commercial center and regional outpost for the fur trade and army during the first half of the 19th century. As the fur trade waned in the latter decades of the century, it took on a larger role as an important location for tourism. Long renowned for its natural beauty, the Island became even more popular as a destination for those looking to escape everyday life. Wishing to preserve the beauty and historic nature of the Island (and avoid scaring the horses), automobiles were banned in the downtown area in 1898 and Island-wide a few years later.